Do you want to pursue an education in the law? 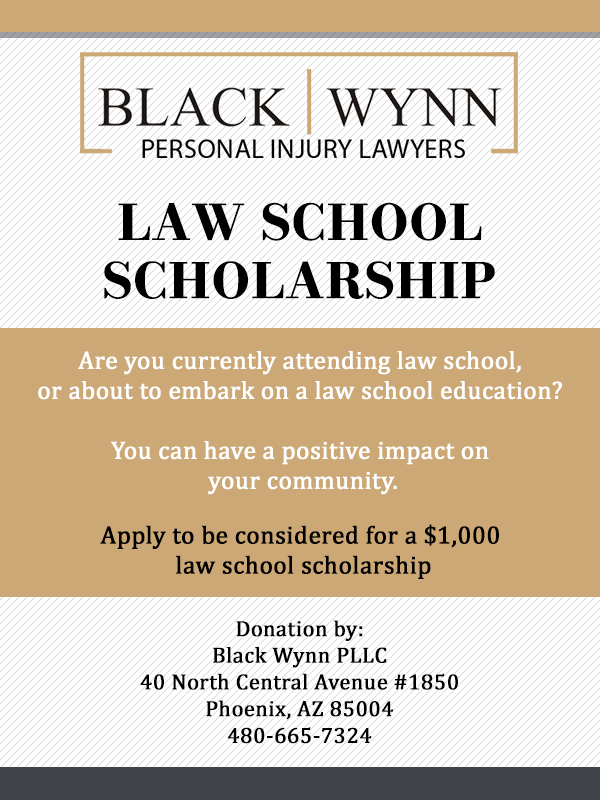 Black Wynn, a Phoenix personal injury law firm, is once again offering a scholarship in the amount of $1,000 to defray a portion of the law school tuition for the winning applicant. The cost of a law school education is substantial in terms of time and money. Our firm understands this, and we are offering the scholarship to encourage those who would like to pursue a legal education, by easing to some degree the financial burden involved. We also believe that a legal education can provide the basis for making a difference in one’s community. The scholarship will assist in the cost of law school tuition and will be paid to the school chosen by the winning applicant. There is no requirement that you be currently enrolled in law school at the time you apply for the scholarship, but you must use the tuition funds within a year of the award. The scholarship funds will be paid directly to the educational institution, which must be an American Bar Association (ABA) accredited law school. Applications may be submitted by U.S. citizens who are or shortly will be attending a United States law school accredited by the ABA. Your application (inclusive of any uploads) must be furnished to us no later than February 12, 2020. Provide a short statement of 125 words or less explaining your reasons for pursuing a law degree. (Optional) Provide an essay of up to 650 words explaining how you intend to utilize the law degree to make a positive impact on your community. I accept the rules and regulations of this contest. The scholarship winner will be chosen by Black Wynn PLLC, in its sole discretion. The winner will be notified not later than June 24, 2020. Your application and its contents, once submitted, become the property of Black Wynn PLLC. We do not sell the information you provide to us. However, we reserve the right to disseminate the information as we deem appropriate to publicize or report on this scholarship and/or the firm’s scholarship program.